A cluster of pink Barrel Cacti rest under the first light of dawn below a desert arch under the night sky in this blend of two exposures - one at 3am and the other during blue hour - to capture the full diversity of light in the scene. I'm honestly a little nervous to share this one, because of the sheer amount of work that has gone into it. This image is the result of about 5 hours of development work in the digital darkroom, after about 7 hours of driving and one very long, cold, sleepless night of photography alone in the desert wilderness. The final image is a blend of two exposures. 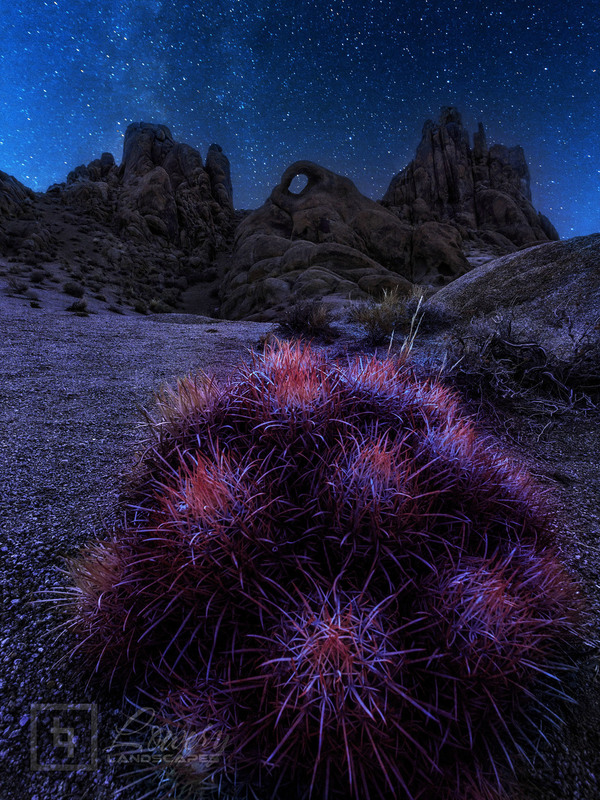 The first was made around 3am to capture the starry night sky, and the second for the entire foreground was made about 90 minutes later during the blue hour of pre-dawn twilight to get enough light to illuminate the cacti and desert rock formations. The hard part was blending everything with all the various color and tonal corrections to make it all come together seamlessly and reveal the scene as I had pre-visualized it before ever leaving for the trip. I hope you enjoy the result! I'd also like to give a huge shoutout to Miles Morgan and Ryan Dyar, two of the most incredible and inspirational landscape photographers I know of, who's work in this area has been a tremendous inspiration to me.